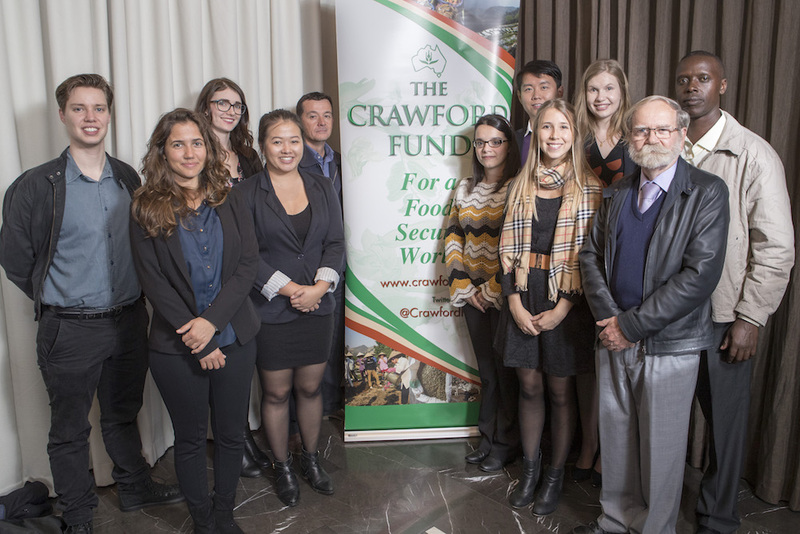 The Crawford Fund has a number of programs to encourage the next generation in international agriculture for development – in their studies, careers and in volunteering. There’s our opportunities in volunteering for projects overseas through the Australian Volunteers Program; our work with Researchers in Agriculture for International Development (RAID), and our special international student awards to enable students to be involved in overseas projects as part of university study. Our conference scholarship program started in 2010 in the hope that by experiencing the Crawford Fund conference and network, our special program of activities around the conference and being mentored by inspirational experienced researchers, young researchers would be inspired and energised to be more involved. Our competitive Conference Scholarships are offered to young people with a genuine interest in international agricultural research and development to attend the conference and a special set of activities that we have developed since the program commenced in 2010. Our conference scholar alumni now stands at almost 270. One of the requirements of the scholarship is that each scholar provides us with a reflection on their experience and we will be providing those reflections over the coming weeks, grouped by State. Once again, we would like to thank our wonderful mentors who volunteer their time and offer valuable guidance, support and insights to the scholars throughout the conference. Our scholars’ mentors are listed with each scholar’s report. Ten scholars from Queensland attended the 2018 Crawford Fund conference – three supported by Central Queensland University, two each supported by Sunshine Coast University and the University of Queensland (UQ), and one each supported by the Australasian Agricultural and Resource Economics Society (AARES) QLD and UQ, the Centre for Horticultural Science, Queensland Alliance for Agriculture and Food Innovation (QAAFI) at UQ and the Centre for Nutrition and Food Sciences, QAAFI, UQ. The Crawford Fund Conference, held in August 2018, was entitled “Reshaping Agriculture for Better Nutrition: The Agriculture, Food, Nutrition, Health Nexus.” The conference brought together individuals from different disciplines and in varying stages of their careers, with a kindred passion and goal: to feed a growing population with nutritious and sustainable food. The diversity in disciplinary specialty was brought up time and time again throughout the course of the conference, with speakers and chairs citing interdisciplinary collaboration as one of the keys to success in a global nutritional forum. Having come from a livestock production-based perspective, the 2018 Crawford Fund Conference provided an exciting platform to explore other agricultural and nutritional sectors, and to discuss and understand the role that livestock plays in the wider scheme of global food production. The agricultural, nutrition, and health worlds are interrelated and highly dependent on one another and transdisciplinary interactions must occur for global goals to be met. I gained a greater depth of understanding of the complexities of the global nutrition crisis and learned of the stark differences between developed and developing countries, despite the issue of malnutrition existing in both situations. Dr Alessandro Demaio presented a series of astounding statistics on global malnutrition, with the conclusion that “88% of countries face a serious burden of either two or three forms of malnutrition” and 41 countries face a triple burden of obesity, anaemia, and stunting. The production of food at an increased yield is simply not enough anymore, there is an increased and urgent need for more nutritionally fulfilling food. However, the issue of malnutrition requires an understanding of the context for the appropriate solution to be applied. Solving the global nutrition crisis is not a ‘one solution fits all’, with different ecosystems requiring varying production systems. The mentorship aspect of the conference is one that is quite unique and provided an additional network of support and discussion. My mentor, Gerard McEvilly, came from a horticultural background, compared to my livestock production one. The difference in our disciplines encouraged many thought provoking conversations and broadened my perspective on food production. This was also reflected in the numerous conversations I had with the other scholars, all of whom came from varied backgrounds. The Crawford Fund ensured that there were plenty of networking opportunities over the course of the conference, and I have come out with a plethora of invaluable contacts as a result. The 2018 Crawford Fund Conference was a profound experience that has changed my perspective and approach towards agricultural research. The experience has left me with innumerable contacts and a greater understanding of the required interactions between disciplines to ensure a nutritionally secure future. I am grateful to Central Queensland University for funding my scholarship and for this opportunity to gain a deeper understanding of how I can contribute to feeding the growing population with nutritious and sustainable food. The 2018 Crawford Conference titled “Reshaping Agriculture for Better Nutrition: The Agriculture, Food, Nutrition, Health Nexus” explored the complexities surrounding food security and environmental impact. Prior to attending the conference, my biggest concern surrounding food security was ensuring we can provide enough food in the future. However, since attending this conference, I now have an understanding that is it not only a question of quantity, but also delivering quality food that remains a plight for researchers. In fact, it was the keynote addresses by Dr Alessandro Demaio and Dr Jessica Fanzo that really opened my eyes to this issue; citing 1 in 3 people were malnourished globally, with both under- and over-nourishment often residing within the one country. Throughout the conference, the case study presentations provided a nice link between research and real-world application. This type of presentation is important as it encourages young scientists such as myself to consider the greater societal impact their work may have and how we should shape our research outcomes to affect real change. The mentor program provided a fantastic opportunity to meet with established researchers, allowing discussion of common research interests. This was further developed during the Sir John Crawford Memorial address where networking with other Mentor-Mentee pairs was encouraged. Being partnered with a Mentor was also a great way to discuss different career path options, with my mentor in particular becoming a ‘sounding board’ for my many thoughts and questions surrounding a career in research. Finally, it was fantastic to attend a conference where women in science were so greatly represented. This was seen not only in the relatively even mix within the scholars and mentors, but also through the numerous presentations at the Conference. Quite often this can be overlooked by conference organisers, but Crawford’s obvious consideration of this provided a refreshing perspective and motivated me as a young female scientist. My sincerest thanks go to Central Queensland University for providing me with the opportunity to attend the Crawford Conference in 2018. I also thank the Crawford Fund and RAID for organising such a fantastic conference. Firstly, I must thank the Crawford Fund and CQUniversity in being able to attend this year’s conference, scholars’ days and RAID network event. It has been over 10 years since I was first made aware of the Crawford Fund while working on an ACIAR project in Indonesia. Even back then I was always keen to attend and had heard about how worthy an event it was. To finally get the opportunity to attend, I am very appreciative. I found the whole event well organised, very rewarding and believe it is an invaluable experience for anyone who is or is looking to get into the international aid sector in their career. I would recommend anyone who is reading these reflections to consider attending in future years as I believe they too will find it highly rewarding and worthwhile. The Crawford Fund conference and scholars’ days provided me with the opportunity to connect and engage with students and researchers within my field of interest and across the various other areas of research that is conducted in an agricultural development context. This was achieved through both formal presentation and informal discussions and interactions. The event was invaluable in terms of furthering networks and contacts within the industry and also having exposure to the broader and multifaceted challenges that face us. The broad range of speakers and topics covered over the couple of days was interesting and insightful. In addition to the conference, the RAID network event and scholar activities were excellent for those new and keen to get into the international aid field. Interaction with current RAID-ers who provided firsthand experience and advice was invaluable to the younger scholars amongst our cohort. Anyone new to this area I recommend you join the RAID network and enjoy the benefits of being involved. Personally, I am excited to be re-introduced to the international aid space and am keen to pursue further collaborative projects in the area after attending the Crawford Fund conference and scholars’ days this year. I have been to many conferences as a student, most of them related to my area of research, but few of them had such a deep impact as the Crawford Fund Annual Conference 2018. The excellent topic of discussion chosen for the conference along with the formidable speakers and the promotion of activities for scholars built a rich environment for debate and development of new ideas. I would strongly recommend any one with interest in agricultural development not to miss the chance of attending the Conference. Alarming data about the occurrence of malnutrition and obesity in the same countries set up the scenario for discussion: millions of children around the world are stunted, wasted or obese, thus this year`s theme “Reshaping agriculture for better nutrition”. It was surprising to me to see some of this data, mostly because I was not aware of the long-term social consequences of malnutrition, barely mentioned when discussions around food arise. The double burden of malnutrition and obesity and the immense range of impacts presented at the Conference were also eye opening to me, reminding me the role of agriculture is not only providing calories, but also nutrition for society. Several initiatives around the world have been in development to attend the nutritional needs of the population. From agricultural to livestock management practices, all demonstrated the importance of transdisciplinarity when addressing food systems and their improvement. One of the highlights for me was the project of increasing production of the highly nutritious sorghum and millet crops in Kenya and the brilliant strategy of developing a cooking reality show to promote dishes with these products. In my opinion, engaging the public in this initiative was a fantastic way to strengthen the market for these new nutritious foods and is a good example of how to promote crops. Traditional edible vegetables were also part of the debate. Often times neglected in benefit of other major crops, the use of these plants, adapted to local conditions, could be an important source of nutrients. In this case, the development of local seed stocks and cultivation techniques along with promotion of their consumption within communities could help tackle malnourishment. I found it particularly interesting to see these crops being shown to children with the use of games and activity books, and a good example of how healthy eating can be promoted. Overall, I would say that participating at this Conference made me learn a lot, but also made me question many of my personal habits, the relation of people with food and the acute need for a change in society to have a nutritious diet, “leaving no one behind”, as said many times, and with sustainable agricultural practices. I am profoundly inspired by everything I have heard and I am even more motivated to follow my purpose in doing my part to contribute to the development and use of sustainable agriculture. I believe many of the people present in the Conference feel the same and I hope that we can all in our own ways sow the seeds that will nourish the future generations. The 2018 Crawford Fund Conference (CFC18) brought innovation to the event, including in its discussion the nutritional component of agriculture. It was an honour to be part of the Conference as a scholar, thanks to the support of USC and the Tropical Forests and People Research Centre. In the next few paragraphs, I report the main content highlights of this meeting, along with personal reflections I made during the sessions. I invite you all to participate in these reflections, at the end of the day, we all need food, fibre and fuel to conduct our lives and as such, these topics are directly related to you. If you are an agricultural sciences student, hopefully I will encourage you to come to next year’s conference by sharing all these amazing experiences. For the scholars, the event starts even before the Conference. We all met in Canberra one day before and one after CFC18, for not only an excellent preparation/warm up for the Conference but also well-designed activities to promote networking and research interests’ exchanges and opportunities. I met people from fields as diverse as veterinary science to business, agriculture to social sciences and the most amazing was to see that, as different as they all may seem, these fields of study overlap in the food systems realm, and it all interferes on natural resources management and nutrition. The CFC18 organisers also connect each scholar to a mentor, someone more experienced in each one’s specific field of interest. The mentor guides and prepares the scholars to extract the best from the occasion, and they may also keep in touch throughout the scholar’s career. It was the first event I have ever been to that promotes such interaction and I think other events should adopt this. The mentoring systems strengthens the experience and I am sure that, just like me, other scholars have established a connection with their mentors beyond conference days, which will accompany them into their professional/research careers. Another highlight was Ms Frances Adamson’s (Secretary, Department of Foreign Affairs) excellent Sir John Crawford Memorial Address. Among other aspects, she emphasised the link between political conflicts and food security, and the major role that responsible agriculture and natural resource management have in maintaining national and international security. It was a brilliant introduction to CFC18’s topic and certainly triggered deeper reflections on all the following Conference sessions. Sessions 1 and 2 presented some very alarming and worrying stats on the current state of nutrition worldwide. The world is experiencing an unprecedented moment of food-related health and social issues: hunger, malnourished, obese, diabetic children and overall population, among other serious diseases. There is a political social root to that, but certainly an agricultural one too, as most unhealthy foods have as a base, biotech/GMO commodities, mainly for use in heavily processed foods or for livestock feed. The meat industry, according to Dr Demaio’s presentation is producing 468% over the global need and excessive meat consumption is directly related to major diseases such as cardiovascular issues and cancer. So, why is the biggest portion of agricultural subsidies in most of the countries still prioritising the production of commodities that make people sick? And why is there still hunger on a planet whose problem is not anymore meeting a surplus production demand, but reorganising its economic dynamics so nourishment is more equally distributed? Utilising traditional foods to address malnutrition. Two out of the 3 case studies drew attention to a need to integrate traditional foods into agricultural projects. Besides having high nutritional content, these foods are also easily available to local communities. Exploring the utilisation of traditional foods (both of plant and animal source) is a recent trend, given their high genetic variability and thus resilience to thrive in adverse environments and climate change. The case studies on utilising community gardens, children’s games and recipe books to promote traditional foods in PNG and using reality TV shows in Kenya on healthy food preparations, opened up the perspective for me that, as an agronomist, technical excellence is not sufficient to engage communities and promote behaviour change on the table and in the fields. Creativity, socially sensible strategies and media means can help a great deal the consolidation of sustainable agricultural practices for food security and nutrition. Case studies from Bangladesh and East Timor emphasised nutrition sensitive agricultural approaches proposing diversification as a key aspect of strategies to benefit communities improve their nutrition and food security. There was also a presentation on biofortification of cereals, whose ethical and ecological concerns were contested by some members in the audience during Q&A. One very interesting aspect of session 4 was the diversity of approaches presented by the case studies, reflecting the broad scope of the Conference. Another plus on CFC18 was the balance of women and men both as scholars and speakers, and the diversity of participants’ backgrounds and ages. This reflects a positive change in the agriculture sphere. The event being held in the Parliamentary House is also an excellent emblem of Democracy including these positive proposals and changes in the agenda. The content on both the Conference and Scholar days covered a broad range of information, from tips/opportunities to leverage your professional career to specific topics on social sciences, agricultural, nutritional and health expertise. Moreover, it drew attention to all future scholars and stakeholders to improve their skills on how to analyse situations and propose solutions considering contexts from a multidisciplinary perspective. I highly recommend participating in next years’ Conference as the dedicated organisers will certainly improve it even more. You will surely widen your perspectives and realize how agriculture, nutrition, health and sustainability have more in common than you think. I was incredibly fortunate enough to have attended the 2018 Annual Crawford Fund Conference as a scholar. As a first year agricultural science student, I walked into the three days in Canberra slightly overwhelmed; but completely ecstatic to be surrounded by such a wealth of knowledge. Being a first year undergraduate student, there was so much to gain from this experience. Given the fact I have not chosen a specialised area, the Crawford Fund Conference was a fantastic opportunity to hear about the various pathways and career opportunities available in the agricultural science field. Speaking to other scholars in both early and later stages of their research provided a great insight to the path ahead of me and potential areas of interest that I had not previously considered. The networking throughout the program was outstanding. The chance to speak with other like-minded young scholars pursuing a similar path to myself opened many valuable discussions and friendships. On top of this, receiving mentoring from Professor Bob Lawn allowed me to further discuss and reflect on the best ways for moving forward in the agriculture sector. Sharing a passion and drive with both young and experienced members of the agricultural science community only further fuelled my involvement in the sector. A particular aspect that I enjoyed from the scholar days was hearing about the volunteer opportunities in international development and the impacts these can have for the involved communities and a career. Learning about the various organisations to initiate involvement was extremely useful as a first year student with much more to learn and experience. In terms of the conference, one of the most interesting aspects was the focus on international development and food security. In particular, the presentation given by Dr Anna O’Kello was of great value. Dr O’Kello highlighted the importance of considering context when developing management systems and global goals. I thought that this was a very important comment to make with a growing push by communities in Westernised countries to halt livestock production worldwide without recognising the contributions it makes to reducing poverty in developing countries. Furthermore, a theme explored throughout the conference that I had not previously looked into in depth was the concept of diversifying our food systems. Joanne Kane-Potaka highlighted the nutritional benefits of adding nutrient-rich foods millets and sorghums to the current 3 staples: maize, wheat and rice. Not only did she explore the idea that these provide nutritional benefits, but also the environmental benefits such as reduced issues with pests and diseases as well as reduced fertiliser and water inputs. Dr Marco Wopereis further built on Joanne’s presentation by introducing traditional vegetable varieties vs. commercial vegetable varieties. Both of these presentations were highly informative and shed light on the potential future of our food systems. Overall, the Crawford Fund Conference has most certainly been the highlight of my year and experience in the field of agriculture. The opportunity to hear the experiences and career paths of many world leaders in the field as well as those just starting out really was a fuel for my passion. I would attend this event again without a second thought and hope that I do find myself at the conference in a few years’ time benefiting in a completely different way to this year. I hope to see more undergraduate students attending this event in the following years and would highly recommend the Crawford Fund Conference along with their other events to anyone interested in or involved in agriculture. I have always had interest in how the Crawford Fund undertakes its activities and how captivating and motivating their activities appear on their website. When I saw an advertisement on the university website encouraging, self-driven, motivated scholars and researchers to apply for consideration for the annual 2018 Crawford Fund Conference, I gave this competitive process a try. I was lucky to be nominated to represent the University of Queensland during the conference. What followed was magnificent planning – from the program to the speakers, and from research to detailed case studies, nothing was left to chance. The theme was, “Reshaping Agriculture for Better Nutrition: The Agriculture, Food, Nutrition, Health Nexus,” and the Crawford Fund Chair, The Hon. John Anderson, AO gave an exciting view that morning setting the pace of what would be a touching base of science and reality. His statement, “It is unless we confront the truth using facts and ask the hard questions, then we are not telling the truth to ourselves,” was momentous to me as it opened my thoughts on how global challenges were to be addressed at a global arena. From the outset, it was obvious the panacea for food security and a healthy population has hinged on agriculture and that for the sector to perform measurable targets had to be developed. The success of the agriculture sector from the time of the Green Revolution was explored but from time to time, the interruption of the presentations by an increasing global malnutrition and food insecurity focus in some regions captured my attention. Through this, I realised the world has been too long pre-occupied with food quantity with little attention on the quality. Giving different scenarios particularly from the developing countries, on the role research is doing in addressing food security, I was motivated by the silent voices doing an exceptional role in addressing the double tragedy of poverty and food security and how this war shall be won. On the second day, a further surgery on food nutrition nexus and the shifting burden of malnutrition was done. I captured the sense on how the world had neglected production of healthy foods and that the role of research and policy through an array of partnerships can still set the bearing of having nutritious food. My interest in the work of Dr Sandra Demaio and Dr Jessica Fanzo during their presentations on the role trade, apart from research could offer, in alleviating malnutrition gave me an understanding on how multi-sectoral approaches would be beneficial in addressing these challenges. The key take home message for me was, ‘While we concentrate on the common foods driven by market, we forget the ready nutritious foods that are available’. The other themes echoed by presenters, were that solutions and evidence to these challenges were there, and leadership must come from governments and intergovernmental organisations. Interesting case studies were presented, particularly in Kenya where production of poultry feed using waste was being undertaken and lifting the livelihoods of slum dwellers. For me, this provided hope that solutions were many, and they could come from anywhere. Our work on this field is to have research that is promoting a more inclusive understanding of the challenges we face to be able to offer multi-disciplinary solutions. The mentoring and networking for me were the most interesting and enjoyable periods during the conference. This gave me a platform to catch up with the day’s speakers and to get clarifications from the presenters. I want to sincerely thank my mentor, Ms Irene Kernot, who gave me her valuable time and took time to introduce me to different professionals during the conference. I not only learnt a great fortune from her role in ACIAR, but we shared a common interest in horticulture. She was extremely instrumental during my conference experience and ensured all my questions and clarifications were answered. The scholarly days were exciting, and captivating as young scholars shared their experience and fears in research to a team of selected panellists. I learned a lot from the team on their different areas of studies, interests and aspirations. While sharing with scholars, I met Dr Mugera a renowned economist who shared with me his passion and the drive to reach global audiences in research. His words of encouragement on how young scholars would leverage on the potential to reach a wider audience using platforms such as the Crawford Fund activities. With the support of institutions such as ACIAR, DFAT and other global partners, I took it as a challenge that nothing is hard for a determined soul. I intend to use the knowledge, network and the support of the Crawford Fund to improve my Work Plan on Return (WPR) and further my research in science. As a member of the RAID team, I promised fellow RAIDers, to go and build a new team of RAIDers in Kenya in future and to commit fully in contributing and supporting the noble ideas of this wonderful forum. Once again, I thank The Crawford Fund for the opportunity and support you offered me to participate in the conference. “I dedicate this award not to myself, but to the many people I have worked with and the silent voices that have added an input to my work. I carry all your aspirations! Today is their day and, on your behalf, I celebrate you all.” Clarisa Collis Winner of 2018 Food Security Journalism Award, during the trophy presentation! I had the wonderful opportunity of attending the Crawford Fund’s 2018 annual conference held in Parliament House, Canberra on 13 and 14 August. The theme of this year’s conference was ‘Reshaping Agriculture for Better Nutrition: The Agriculture, Food, Nutrition, Health Nexus’ which focused on the challenges and opportunities in delivering healthy diets to the world’s increasing population while also minimising environmental impact. 2 billion people lack key micronutrients like iron and vitamin A. 151 million children are stunted while 51 million children are wasted. 38 million children are overweight and 2.1 billion adults are either overweight or obese. Undernutrition results in a 22-45% reduction in lifetime earnings. The economic impact is estimated to range from 2-3% of GDP to as much as 16% in the most affected countries. Hence the urgent need to transform food systems to improve the quality and nutritional value of food and develop policy solutions to promote healthy eating. Speakers stressed that solutions require strong leadership and an integrated approach that brings sectors together. Experts in the fields of agronomy, smallholder farming, livestock, and aquaculture systems presented initiatives that put agriculture at the centre of international development through increasing environmentally sustainable food production, targeting nutrition and alleviating poverty. Some initiatives aim to encourage a change in consumer behaviour and a shift in eating habits, for example, back towards eating traditional vegetables in developing countries. Dr Marco Wopereis, Director General of the World Vegetable Centre, highlighted the greater nutritional value of traditional vegetables compared to commonly grown vegetables and the environmental benefits: increasing dietary diversity improves biodiversity. The ICRISAT Smart Food initiative is a program that aims to deliver food that is good for health, the planet and the farmer. This initiative has introduced education programs and even produced a reality TV cooking program to influence consumer behaviour in Kenya. The initiative focuses on the nutritional benefits of crop varieties other than the world’s three main food crops (rice, wheat and maize) that are high in calories, yet low in key micronutrients such as iron. Another project focuses on developing new innovations to biofortify cereals with iron through agricultural biotechnology. This research emphasises the need to harness modern science and technology to promote climate smart and nutrition-sensitive agriculture. In addition to the conference, I enjoyed attending the RAID (Researchers in Agriculture for International Development) events and Crawford Fund scholar days where I participated in networking activities, met with my specially selected mentor and learnt about the range of volunteering and training opportunities in international agricultural development. I am grateful to have been mentored by Michael Taylor AO who is one of the Crawford Fund board members and well-connected with key people in his field. I really appreciated his introductions and knowledgeable advice. Attending the 2018 Crawford Fund conference provided me with an excellent opportunity to engage with experienced international researchers and people who have work experience in developing countries. Learning about other people’s research and pressing issues in the field of food supply has been of great benefit to the research I’m currently conducting for my Honours thesis in economics where I investigate factors that affect agricultural technology adoption in Ethiopia. I’d really like to thank the UQ School of Economics and the Queensland AARES Branch for sponsoring me to attend the conference as a Crawford Fund scholar. I found it was a worthwhile experience as I feel increasingly inspired and energised to reach my goals and pursue a career in international development. As a PhD student, my area of expertise is virus control in crops. My concern is purely whether or not fruits and vegetables survive out in the field in order to reach the dinner tables of consumers. This work is focused on popular, everyday vegetables in the western world, such as tomato and lettuce. In short, my work is largely about foods that serve to satisfy the needs and wants of people with access to plenty of food. The 2018 Crawford Fund Conference helped me to realise that this kind of focus in research is not enough to help the people who need it the most. The theme of this year’s conference was “Reshaping Agriculture for Better Nutrition”. Many speakers throughout the day stressed that it is not enough to simply focus on feeding the masses with whatever crops are most convenient and calorie heavy. Malnutrition, both in the form of insufficient nutrients and an excess of calories resulting in obesity, are grave concerns for the world over. The main message that I took away from the conference is that while feeding the world is easy, feeding the world with good, nutritious food is a much more noble and worthy goal for us to aspire to. Two speakers in particular stood out to me. Marco Wopereis of the World Vegetable Centre discussed the potential role of traditional vegetables in providing people with the nutrition they need. Marco spruiked vegetables that I had never even heard of before that day or considered as part of a regular diet. Joanna Kane-Potaka demonstrated her work in Kenya, where millet and sorghum were being pushed as crops that were good for the consumer, the farmer, and the planet. These speakers, among others, have inspired me to consider more traditional crops in my research efforts for virus protection, especially as these traditional vegetables may not have the benefits of years of selective breeding for disease resistance that more common crops have. Beyond the one-day conference, the experience provided by the Crawford Fund was fantastic. I have never truly participated in networking events before this conference, but the members of the fund and RAID made approaching an otherwise intimidating activity easy. Between getting to know the other scholars, meeting with my enthusiastic mentor Madeline and hearing from the speakers at the half-day events, I was encouraged to present my own expertise and background to the other attendees, while also seeking out people who could help me to expand my insights into agricultural research. Without the opportunity offered to me by this scholarship, I never would have had such a fantastic opportunity to practice my networking skills and make contact with others in my field of expertise. Overall, I believe that this conference was not only a fantastic chance for me to broaden my own horizons and gain the skills necessary to network with my peers, but also the chance for many passionate and invested people from all aspects of agriculture across the world to come together and share their knowledge. The Crawford Fund conference was a valuable event that will inspire my research for years to come. I found this scholar program to be stimulating, interesting and an eye-opener in many ways. The scholar days encouraged us to embrace diverse perspectives and learn from different views and provided us an excellent environment that encouraged young scholars to move forward in both research and life. The networking did not seem too difficult even for me an introvert researcher with not exactly the same major. The opportunity to be involved in the scholar day and be paired up with a mentor was fantastic and I particularly enjoyed the workshop style sessions at the first scholar day which require open communication between all participants. During the break time, discussing international food security and the development of agriculture made me consider in greater depth of my contribution to this great challenge. It was truly inspiring to be able to get to spend time with many of the brightest minds in agriculture and food research. I collected many new ideas from both the mentor scientists and young researches that has resonated with my research interests in those days. Feeling like I had made leaps in my knowledge by communicating with scholars all around Australia. The Crawford Fund Conference enlightened me with what is happening worldwide. It also amazed me hearing the perspectives of so many people who are working in this field. I appreciate the keynote speakers about their professional working in developing countries, especially considering their capacity to overcome difficulties, maintain their research projects and give their contribution to the global sustainability and of course the local society. The works which have being done with ACIAR and associated organisations is clearly providing much needed contributions to the areas in which they work, as well the international agricultural and food industries. I realized that international cooperation projects could really bring a lot of benefits to the researchers from both countries to share new techniques, knowledge and working experience to make significant progress in the agriculture and food area. The keynote speech helped me understand what role I could play in the grand scheme of agriculture and food area and the direction I could move into for the left years of my PhD. The Agriculture for International Development (RAID) network event provided awesome opportunities to meet people doing research in different areas of agriculture and food. I learnt a lot about Researchers’ experience in RAID. The platform for real promoted research network with some sheared interests in international agriculture and food development. I want to thank Professor Mike Gidley, Director of Centre for Nutrition and Food Sciences (CNAFS), Queensland Alliance for Agriculture and Food Innovation (QAAFI) and Crawford Fund for giving me the chance to go to this extraordinary gathering with an enlightening Scholar Program. I benefited from the Crawford Fund 2018 Conference in many ways, it’s a precious experience I cannot speak highly enough of. And hereby I would highly recommend this experience to anyone interested in next years’ Crawford Fund Conference and anyone looking forward a further career and having activism in international agricultural/food research.